Explosions, flames, and shipwrecks have plagued this promontory. The history of Lands End, the jutting edge of San Francisco's westernmost shoreline, is marked with curious accidents and dramatic shipwrecks. 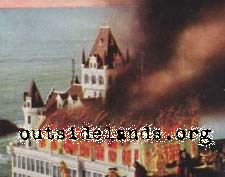 On land, however, only a few events qualify as disasters, most of which were associated with fires. In an odd congruity, one of the more dramatic terrestrial disasters was started by a troubled ship. In the early morning of Sunday, January 16, 1887, an explosion occurred at Lands End that was so powerful it was felt as far away as Sacramento, Vacaville, and San Jose. The source was an abandoned two-masted schooner named Parallel. The story of the Parallel is a study in negligence. Illegally packed at a San Francisco wharf with a dangerous cargo that included forty tons of dynamite powder, the Parallel set sail on Wednesday, January 12, for its destination in Oregon. Three days of uncooperative weather and tides followed, hindering the ship's voyage and placing it no farther on its voyage than Lands End. By Saturday evening, the Parallel was caught in a heavy swell and heading towards the shoreline. The crew, deciding that their ship was doomed and fearing detonation of its cargo, hastily set off for shore in a rowboat. They failed to send out any warning signals before abandoning ship. Left to the ocean's whim, the Parallel drifted until it became lodged on a large rock in the cove below the Cliff House. Local residents went down to offer assistance, but found no one on board. They dispersed after concluding that there was nothing they could do until morning. The ship's cargo, probably ignited by the oil lamps the crew had left burning, finally exploded around 12:30 a.m. According to the crew, who watched from the safety of Point Bonita on the opposite shoreline, there was no light or flash accompanying the blast. Those closest to the explosion saw little but a shower of falling debris and rock in all directions. The following day brought thousands (the crowd was estimated as high as 80,000 people) to Lands End to see the site of the disaster and hunt for relics. An American flag was hung half-mast and upside down as a signal of mourning and distress over the battered Cliff House, but the enterprising proprietors were swift in recovery. By morning, a handpainted "Bar Open" sign was up and visitors were invited inside for drinks and close-up views of the damage. Nearby Seal Rock House, Sutro Heights, and local cottages all sustained damage from flying debris and shattered glass. Despite its violent end, the Parallel caused no deaths and only minor injuries to a few people. 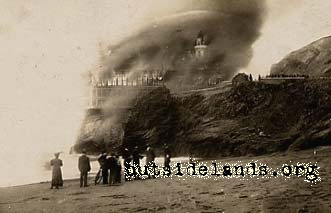 The next disaster to befall Lands End was the loss of the Cliff House to a fire on Christmas Day, December 25, 1894. The Daily Morning Call sadly headlined the news with the words, "Ashen Heaps--The Cliff House is a Reminiscence." The fire had begun around 8 p.m. in a defective flue inside a wall and moved so quickly that proprietor James Wilkins stated that it was hopeless to fight from the start. By midnight, the curious had already begun to arrive and the next day brought thousands more. The proprietors of the Cliff House and its owner, Adolph Sutro, were quick to state that they would rebuild. "Sutro's" Cliff House opened in 1896 and the grand chateau soared five stories higher than its predecessor. The Cliff House survived San Francisco's great 1906 earthquake and fire, but rumors that it had collapsed into the ocean ran rampant. Ultimately, the building was indeed lost, almost as dramatically, to an electrical fire the following year. At the time, the Cliff House was closed for renovations. On September 7, 1907, former proprietor James Wilkins was touring the remodeling when he saw smoke coming through a floor where electricians had been working. He sounded the alarms and in doing so became caught in the blaze himself and had to be rescued. The San Francisco Examiner described the fire as "something sent from the unknown to hold the human mind in awe and wonderment." Once again the Cliff House was gone. Again, crowds descended on the area to see the barren cliff, and the proprietors publicly announced that they would rebuild. Two years later, the third Cliff House opened and still stands today. The worst of the Lands End fires took place on Sunday, June 26, 1966, disintegrating the ghostly Sutro Baths. The blaze also ignited fifteen smaller fires on the roofs of nearby homes. Two hundred firefighters fought the conflagration, and eight were injured. The enormous Victorian bathhouse, which opened in 1896, had become a financial liability for its owners and was woefully dilapidated. An apartment building was planned for the site and demolition of the bathhouse had already begun. The fire quickly finished the work. As thousands of San Franciscans watched, the Sutro Baths followed the Parallel and the first two Cliff Houses into Lands End's disaster history. 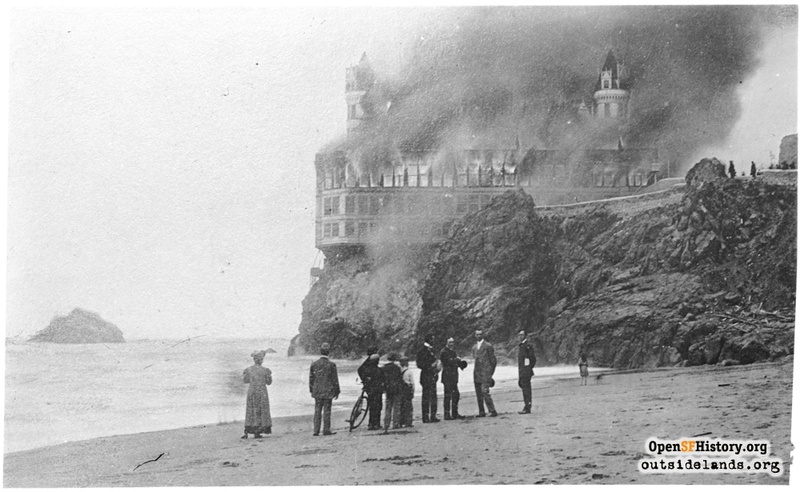 Images: Both postcard images of the 1907 Cliff House fire; SWL collection.